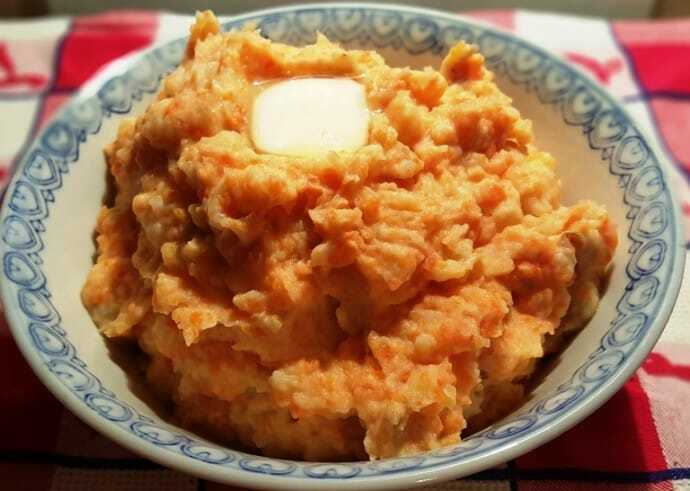 Pressure Cooker Potato Carrot Mash, is a healthier alternative. The Carrots add a beautiful color and a hint of sweetness. When I first moved to Los Angeles, back in 1985, I was a chunky monkey. 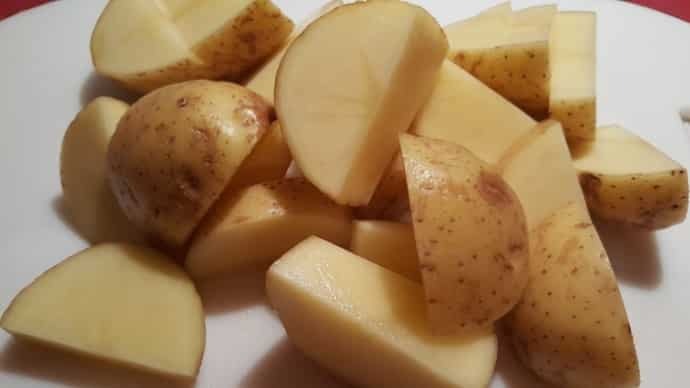 Potatoes are one of my favorite side dishes, pretty much cooked anyway, but especially baked and mashed. I met a really nice French couple while walking my dog, Buffy. Anyway, we became friendly and they invited me to dinner and served mashed carrots and potatoes. The color was so pretty and the taste, well, the taste was delicious. At that moment, I thought, oh my gosh, I can have a big ole serving of potatoes and just intake half the amount of calories of regular mashed potatoes. Well, not exactly, because there is still butter and milk, but, you do get a nice serving of carrots. 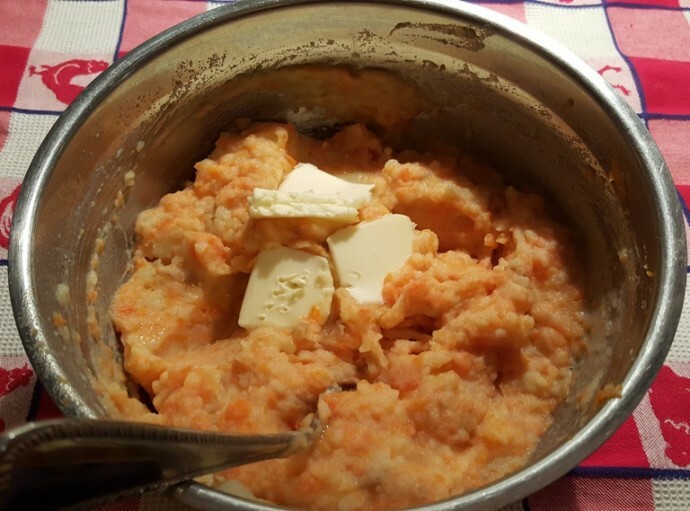 Every since then, when I make mashed potatoes, I mix them with carrots and often times, squash. Cut the potatoes in large-ish chunks. They cook faster than the carrots. 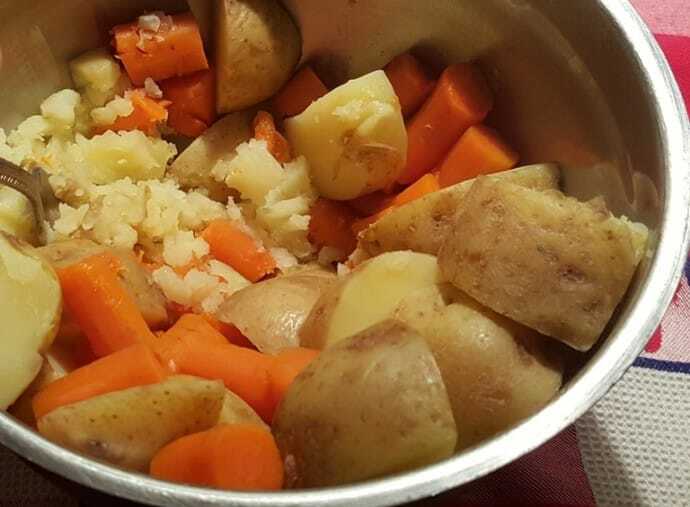 You can see the carrots are cut up in smaller pieces than the potatoes since they take just a bit longer to cook. 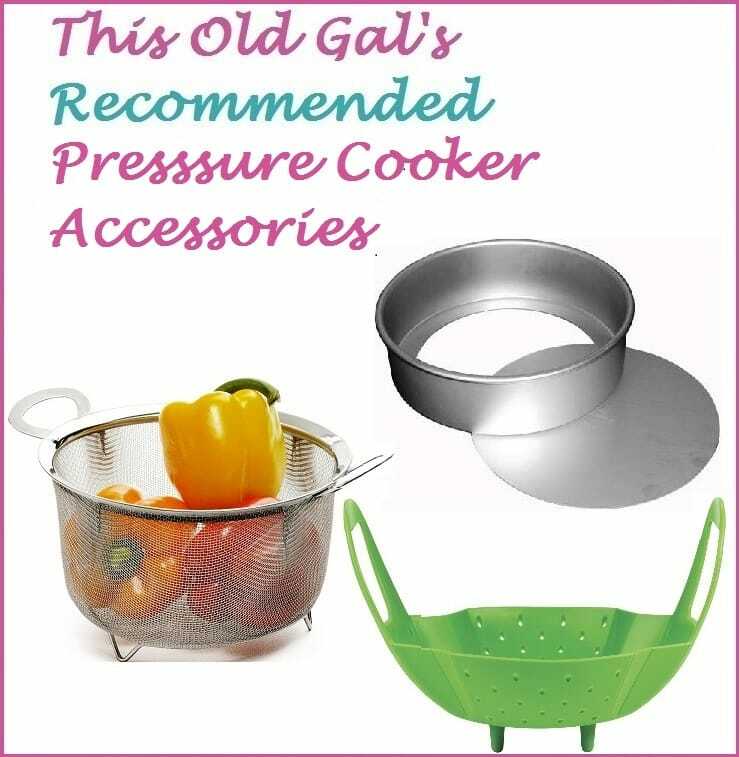 You can either use a trivet, or if you have the Salbree Steamer/Strainer Basket, add the potatoes and carrots to the basket and put them in the Pressure Cooker, with water underneath. The timing of this recipe is based on the size of the cut potatoes and carrots, as I’d like them both cooked to perfection in one shot. Here is where you can get a bit creative. Place the potatoes in a large mixing bowl. 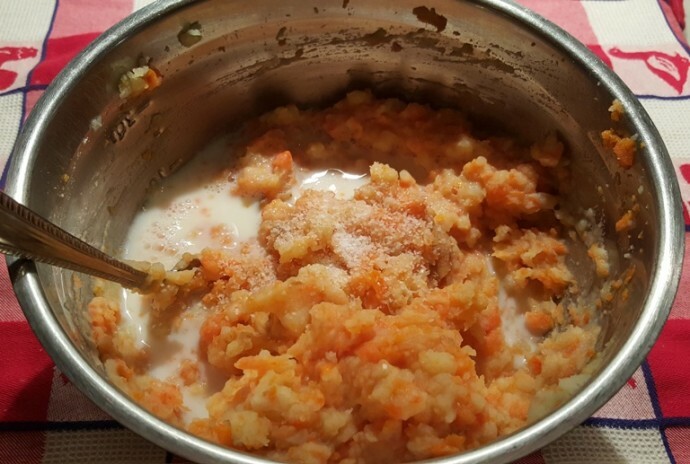 I like the potatoes to have some little chunks of carrots in them, so to achieve this, use a fork to mash the potatoes and carrots. If you want a smoother texture, you can use a beater or potato masher. You may or may not believe me, but it is important to add the ingredients in a particular order. 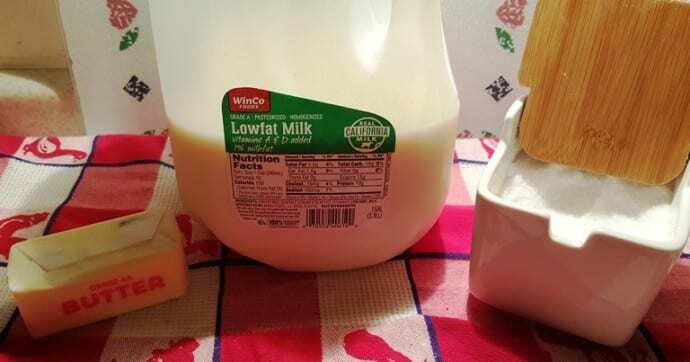 First pour in the milk, cream or half & half, your choice. As you add the milk, salt and butter, you will continue to mash with the fork, so if you want a chunky texture, mash as you go. The salt goes in next. Mash the milk and salt in really well before the next step. Lastly, toss in the butter. The butter should always go in last. This will ensure a nice smooth mashed potato texture and not a gummy texture, which happens if the butter is whipped in first. A little extra dab of butter on top, never hurts. 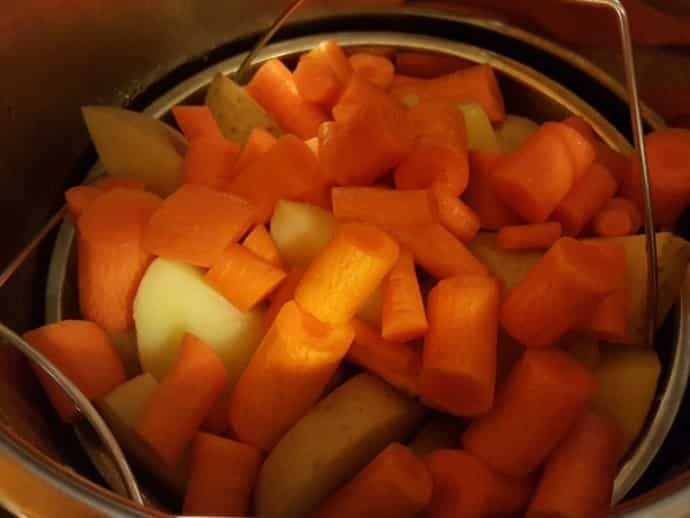 Chop potatoes and carrots, making sure that the carrots are in smaller pieces than the potatoes. Add one cup of water to the Pressure Cooker cooking pot and place a trivet on top. Add the potatoes and carrots to the trivet. Lock on lid and close Pressure Valve. Cook at High Pressure for 8 minutes. Allow a 5 minute Natural Pressure Release and then do a Quick Release to remove the rest of the pressure. 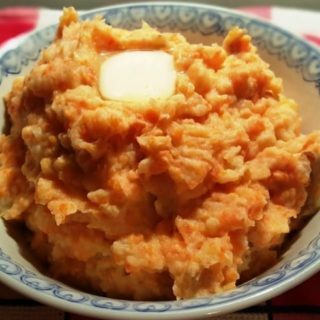 Add potatoes and carrots to a bowl and mash with a fork. Add the milk and continue to mash. Add the salt and mash until completely combined. Add butter and mix in well. Dot with butter if desired. If you want a creamier, more whipped mash, add a little more milk. 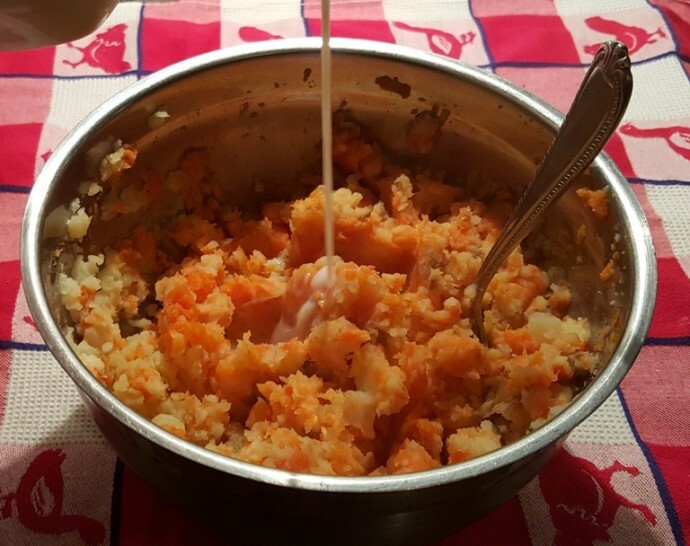 PIN this Healthy Pressure Cooker Potato Carrot Mash!